Claim: Global warming stopped in 1998. Surface temperatures vary from year to year as heat moves between the atmosphere and the oceans (which have a much higher heat capacity). So a couple of relatively cool years following a few relatively warm years may signify nothing more than regression to the mean. When trying to discern long-term climatic trends, it is more useful to look at moving averages than at single years. When we look at a ten-year (or even five-year) moving average, we do see a continued warming beyond 1998. And when we look at the last ten years (2000-2009), we see the trend is still upward. In fact, this is true for every 10-year period back to 1969-1978 (except for a couple which show no trend). In October 2009, the Associated Press “gave temperature data to four independent statisticians and asked them to look for trends, without telling them what the numbers represented.” The statisticians “found a distinct decades-long upward trend in the numbers, but could not find a significant drop in the past 10 years”. One cause of short-term climatic variation is the El Niño Southern Oscillation (ENSO). 1998 was exceptionally warm due to an exceptionally strong El Niño phase. 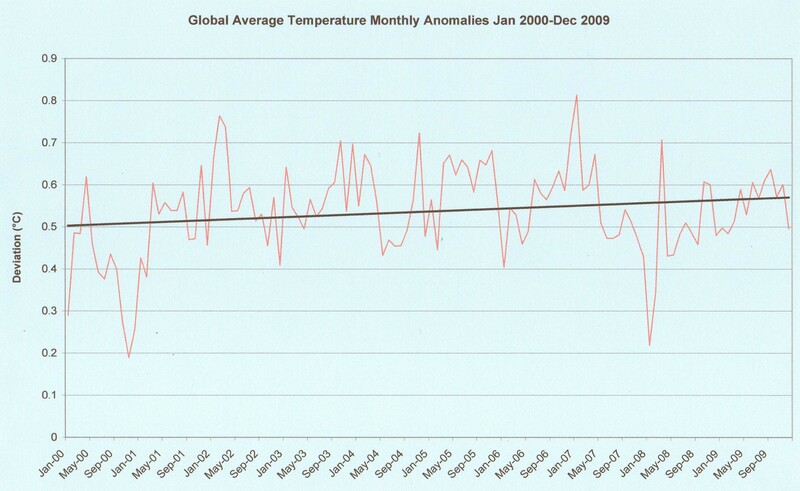 Conversely, the rapid cooling from January 2007 to January 2008 was probably due to a strong La Niña phase. One pair of researchers from the Australian Bureau of Meteorology (BoM) used a statistical analysis to attempt to remove the ENSO signal from global temperature data (up to 2007). Their results showed a warming trend over the past decade, with the highest ENSO-adjusted temperature occurring in 2006. Interestingly, GISS scientists have speculated that the current El Niño, expected to continue during early 2010 (before returning to a neutral phase in the southern winter), may set a new global temperature record. The UK’s Met Office agrees, and their “experimental” decadal forecast predicts that about half of the years in the coming decade will be warmer than 1998. Despite short-term fluctuations due to internal variability, in the long run it’s the overall energy budget, the amount of heat entering and leaving the entire climate system, that counts. Although surface temperature records get all the publicity, they give an incomplete picture (and the same goes for satellite records). Because the majority of the heat absorbed by Earth goes into the oceans, a more fundamental indicator of warming is ocean heat content. Unfortunately, this is more difficult to measure, so until recently there was no reliable data. Then, in 1993, the Global Oceanographic Data Archaeology and Rescue (GODAR) Project was set up to compile old ocean data that might otherwise have been forgotten. By 2000, they had succeeded in gathering enough data to create a record of ocean heat content reaching back to 1955. The latest results tell us that since 1969, the upper oceans (0-700 m) have accumulated energy at a rate of four sextillion joules per year, or 127 TW. This did not stop in 1998. The oceans continued to absorb heat up to at least 2004, although the trend has been relatively flat in the last few years. 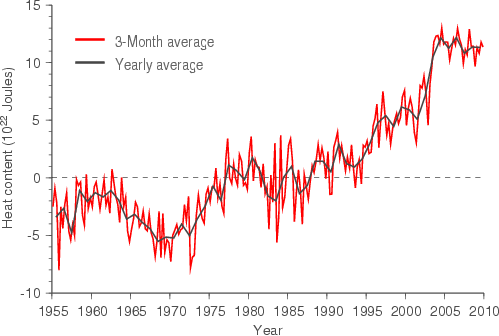 Initial results from the Argo ocean observing network appeared to show the oceans had cooled rapidly since 2003. However, systematic errors were soon discovered in both old and new observing systems: Argo had a cooling bias and older measurements had a warming bias. These corrections helped to reconcile the observations with climate models, and also cleared up an unexplained inconsistency with the observed sea level rise. Admittedly, we still don’t fully understand the Earth’s energy budget. We do know the planet is still accumulating heat, because satellites measure an energy imbalance of 0.9 W/m2 at the top of the atmosphere. (For comparison, that’s 500 TW, or 14.5 sextillion joules per year.) But where is all this extra heat going? Only a tiny fraction is being absorbed by the warming atmosphere and melting ice, and the upper oceans can only account for between 2 and 9.5 sextillion joules per year. Still, the missing heat may yet turn up in the deep ocean. It may have already, according to one recent paper which measured ocean heat content down to 2,000 m and found a warming trend of 0.77 W/m2. Also, it’s worth bearing in mind that on this timescale greenhouse gases are not the only influence on climate. The global energy imbalance varies periodically with the 11-year solar cycle, and from 2003 to 2008 the Sun cooled by 0.1 W/m2. I will discuss solar influences on climate in more detail in a future post. And that’s it for today. I had originally intended to also cover the “hockey stick” reconstruction of past temperatures, but discussing ocean heat content and the Earth’s energy budget took longer than I expected, so I’ve decided to leave the hockey stick for next week later in the series. Watch this space! *All temperature statistics cited in this article, unless otherwise stated, I have taken from the NCDC record. Update 19 April 2010: The plot thickens! It turns out that the ocean warming of 0.77 W/m2 averages out to only 0.54 W/m2 globally. This means the global energy budget is still not balanced. If the satellite measurements are accurate (which they appear to be), then the phenomenon must be internal to the climate system, resulting from the interactions between oceans, atmosphere, land, and ice. Some of the missing heat is going into melting ice sheets and Arctic sea ice, but not nearly enough. Maybe the heat is deeper still in the ocean, or in the ice-covered Arctic Ocean, where we are not yet able to measure. It’s quite a mystery, and it is important because the missing heat may “come back to haunt us” in future internal climatic events. Update 12 May 2010: I’ve posted more on the supposed global cooling here. Yet Another Update 27 May 2010: A new paper has been published on ocean heat content, combining all the different analyses into a single best estimate. Averaged out over the entire Earth, the trend from 1993 to 2008 in the upper ocean (0-700 m) is 0.64 W/m2 (but 0.75 W/m2 is within the error bar). Changes on a five-year timescale remain less certain (though, as discussed above, now the Argo floats can measure ocean heat content at a depth of 2 km, and they show a warming of 0.54 W/m2 since 2003). So the short-term energy budget is still not closed — but it’s not at all clear that this is inconsistent with global warming. Ocean heat content measurements are still in their infancy and subject to a tangled web of corrections, so they are difficult to interpret. Well done, James. You present a very compelling argument on the topic.